SNMPv1 — The Simple Network Management Protocol: A Full Internet Standard, defined in RFC 1157. (RFC 1157 replaces the earlier versions that were published as RFC 1067 and RFC 1098.) Security is based on community strings. SNMPv2c — The community-string based Administrative Framework for SNMPv2. SNMPv2c (the “c” stands for “community”) is an Experimental Internet Protocol defined in RFC 1901, RFC 1905, and RFC 1906. 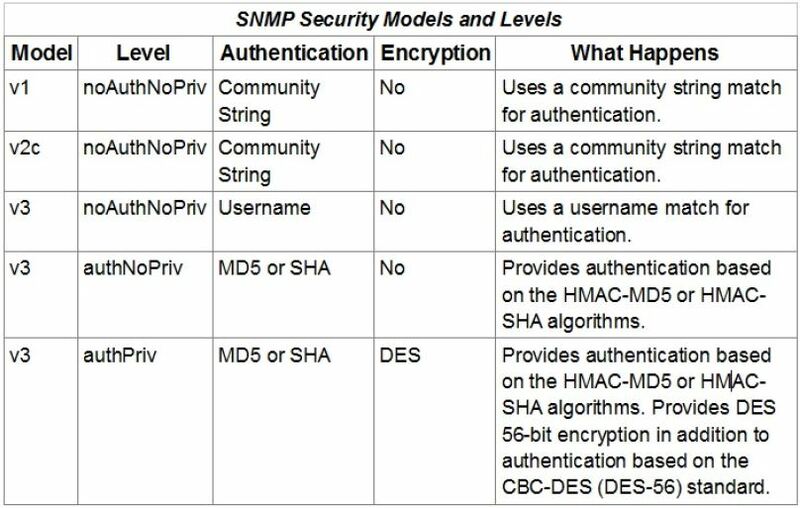 SNMPv2c is an update of the protocol operations and data types of SNMPv2p (SNMPv2 Classic), and uses the community-based security model of SNMPv1. SNMPv3 — Version 3 of SNMP. SNMPv3 is an interoperable standards-based protocol defined in RFCs 2273 to 2275. SNMPv3 provides secure access to devices by a combination of authenticating and encrypting packets over the network.